Performing: Elvis Perkins, Tommy Stinson’s Cowboys in the Campfire, Brian Dewan, Chops and Sauerkraut, Magic Stones, Rebecca Borrer + Special Guests! *Suggested min. donation of $15 At the Door. NO PRE-SALES! Helsinki Hudson – 405 Columbia St. There is a fair argument that the only bands worth a damn are the Rolling Stones and the Replacements. I can see the point, and I’m not going to disagree. Hence the excitement at catching the latter’s former teenage bass player Tommy Stinson at my neighborhood record store. Stinson has long since carved out a post-Mats career for himself with the likes of little bands like Guns N’ Roses and Soul Asylum, as well as his own gigs with Bash & Pop and as a solo artist. This time around, he is touring as Cowboys in the Campfire with fellow guitarist Chip Roberts. These shows have traditionally been low-key affairs, skipping the club scene for everything from record stores and cafes to the South Philly Van Club and a Texas ranch normally reserved for weddings. That approach hints at how rock ‘n’ roll you can expect it to get. It is two dudes well over 40, Stinson playing acoustic and Roberts playing electric, casually traipsing through the sort of songs you write with friends while sitting around a literal campfire: warm, convivial, maybe even a little sappy, but a hell of a lot of fun. (Don’t miss it). 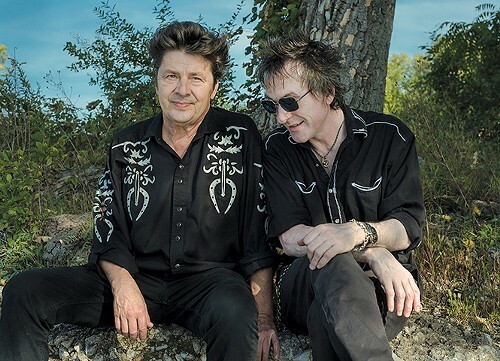 Tommy Stinson earned his rock ‘n’ roll bona fides as the bassist in the Replacements, the scrappy Minneapolis quartet that blazed a boozy trail in the ‘80s as a garage band with a finely honed pop sense. He also served a stint as bassist and musical director for Guns ‘N Roses, before singer Axl Rose reunited with original bassist Duff McKagan. On New Year’s Eve, Stinson joined Green Day’s Billie Joe Armstrong, the E Street Band’s Steven Van Zandt and Blondie’s Clem Burke for an all-star version of the Replacements’ “Color Me Impressed” at a bar in Manhattan. Stinson is far less loud in his country-minded acoustic collaboration with guitarist Chip Roberts, a project they call Cowboys in the Campfire. They’ll hold court at Siberia on Friday.